The US 41 Mason Street Interchange project was part of the US 41 Brown County Expansion project. It included reconstruction of 0.583 miles of Mason Street (WIS 54) and 0.608 miles of US 41. Highlights include 3 bridges, 1 box culvert, 11 retaining walls, 10 sign structures, 3 roundabouts, 1 storm water pond, multi-modal trails and context sensitive solutions (CSS). The CSS elements included stained and textured structures, Native American murals on retaining walls, decorative crosswalks, lighting and extensive landscaping throughout the project. There were several challenges to this very successful project. The project is in an urban commercial corridor. Mason Street is also one of the two primary east-west corridors to access Lambeau Field. Coordination with the stakeholders led to a maximum Mason Street closure of 6 months and a completion by August, prior to Green Bay Packers season. These requirements made winter/early spring roadway construction necessary. Four lanes of traffic were maintained on US 41 throughout the project. Design and construction schedule modifications were made to accommodate high ground water on US 41. To maximize schedule and funding, the project let was advanced 5 months. This fast-tracking of the let required extensive utility coordination to ensure no facilities conflicts during construction. 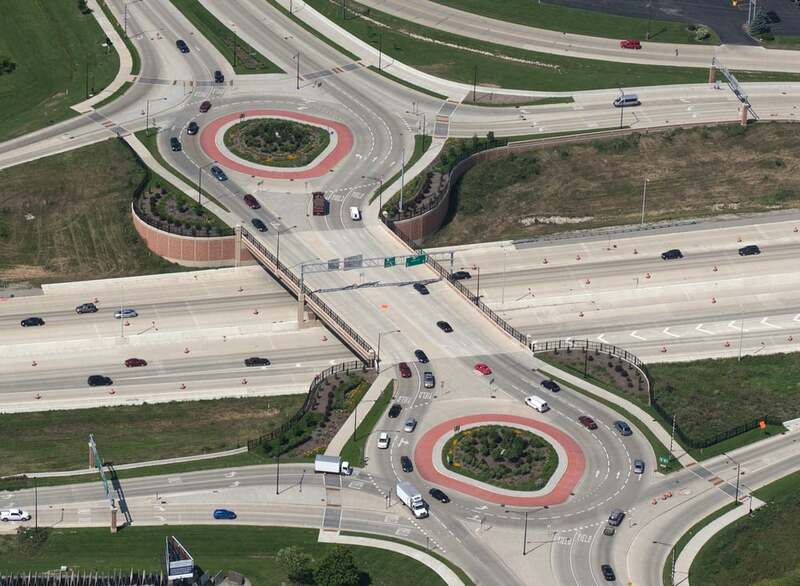 The US 41 Mason Street Interchange project was successfully designed through the collaboration of 11 design consultants and WisDOT NE Region.